Private Investigator, V.I. Warshawski is faced with a situation that taxes even her legendary abilities. Called out in the dead of night to help the nephew of an old friend (who has come under police suspicion); as a body is found in the woods. Soon she finds herself right at the epicentre of a most troubling case. Remarkably this is Paretsky's nineteenth novel featuring V.I. Warshawski, and the series shown no signs of flagging. A deadly conspiracy involving stolen antiquities, the Russian Mafia and shady loan companies come under scrutiny. The landscape of the windy city and the surrounding country is as skilfully evoked as was Chandler’s LA; and the authorial voice is just the right mix of idealism but cloaked in a world-weariness. 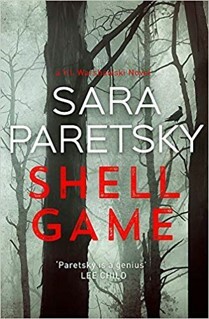 Paretsky’s work is again socially prescient, as she brings to her plot a sharp eye for the current moral panics about immigration and terrorism. Added to this are nods to the nefarious practices of finance companies that trap their customers in debt spirals, and the exploitative behaviour that fuelled the '#MeToo' movement. The action is, as fans have come to expect, full on with Warshawski, literally, shedding blood to bring down the bad guys. There is also a distinct political edge to this book, indicating that ‘the system’ and its ‘white-collar’ criminals, are as culpable as any of the individual ‘blue-collar’ crooks. Some long-standing detective series simply run out of steam, while others fade into comfortable clichés, while only a very small number go on - getting better with each new addition. Sara Paretsky’s V.I. Warshawski novels are part of this elite group, neither she nor her creation, look likely to be going quietly into the twilight any time soon, which is welcome news for her legion of readers.